Singer Chris Brown made his required court appearance at the L.A. Criminal Courts Building in downtown today. 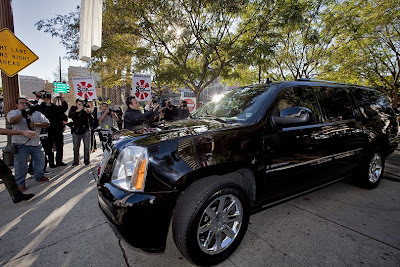 Brown arrived through an underground parking entrance to allude the mass throngs of paparazzi and press. Brown's family arrived via the parking lot behind the courthouse and were hounded by a mass throng of media. Phil Spector was spotted leaving the courthouse in a surreal moment by photographer Jonathan Alcorn, as the Brown family passed by. Keeping the surreal moments going, designer Bobby Trendy was spotted leaving the courthouse pushing a baby carriage with a small dog inside, while wearing glitter and tall black wedge heels. Brown, who is charged with two felonies, is scheduled to re-appear in court on April 6, 2009 to enter his plea.